The pinnacle of a child’s birthday party has to be the introduction of the birthday cake. The lights are dimmed down, the children are eagerly waiting around the table; and the birthday boy or girl sits at the head of the table excitedly. Then, someone enters with a gorgeous birthday cake lit up with fabulous birthday candles. The candles are an important part of the birthday cake; they add a little sparkle and a lot of magic to the whole birthday. But, as with anything these days, there are so many different types of candles to choose from, so which would suit your child better? The second question is when do you actually introduce the cake to the birthday party? More often than not, the amount of candles on the child’s birthday cake represents how old the child is on that birthday. However, some parents choose to have the child’s name in candles, or even the words “happy birthday”. 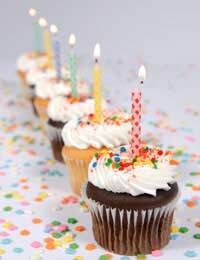 The exact origin of birthday candles is unknown, but it can be traced back to Germany in the 18th Century. And, as candles are slow burning, it is thought that they represent the passage of time – hence the reason the age is mirrored in the number of candles. To make your child’s birthday cake stand out from the rest, why not opt for candles that burn with different coloured flames. The colour of the flame usually coordinates with the colour of the candle. So, pick your child’s favourite colour and watch their face as you walk in with the birthday cake. Rather than having one candle for every year of age, why not use number candles instead. This can take the hassle out of lighting numerous candles. Number candles are available from 0-9, and they can be made to make any age. The musical birthday candles have a base that can be switched on to play “happy birthday”. They don’t usually have to be lit to play the music, but these birthday candles can make a superb entrance – and they provide a tune for everyone to sing along to! If your child’s birthday party is following a specific theme, having a cake and candles to match that theme will be great. For example, if your child is a huge fan of trains or cars, there are a number of retailers that sell train and car candle holders. For preschoolers, there are candles that are made to look like wax crayons; or you may even be able to find candle holders, or candles in the shape of their favourite animal or cartoon character. Most parents choose to save the birthday cake for the finale of the birthday party – it can be a nice way to end the hectic party, and is an effective way to calm things down. However, why not try something different and start the birthday party with the cake. Regardless of when you introduce the birthday cake, you will want to make sure that the children are calm and sat down ready. Get the children to sing a nursery rhyme or a song together while you prepare the candles on the cake. You could also have a quick, and quiet, game of pass the parcel or another game that will get the children seated and prepared for the entrance of the cake. Ask another adult to supervise the children while you sort out lighting the birthday candles on the cake. You can also have a signal for when you are ready, then the lights can be dimmed down and the children can be quiet.